Queen Elizabeth II got a 13 per cent hike in her British taxpayer-funded allowance ahead of extensive repairs to Buckingham Palace, estimated to cost around a whopping £369 million (Rs 3,319 crore). The 92-year-old monarch’s accounts released on Thursday showed the public funds used by her for official expenditure and duties went up from £41.9 million (Rs 377 crore) to £47.4 million (Rs 426 crore). More than £4 million (Rs 36 crore) of that hike was spent on the initial phase of palace modernising, including the removal of old wiring, while £21.4 million (Rs 192 crore) went on staff payroll costs and the rest on travel and other maintenance costs over the previous year. Large-scale refurbishment work on Buckingham Palace’s east wing will begin in April 2019, which is expected to cause years of upheaval for the royal family at their traditional London residence. The removal of nearly 10,000 treasures from the Royal Collection installed in the wing will begin in the coming months. Priceless antique furniture, paintings and tapestries will be moved to other wings, transferred to other palaces, lent to exhibitions or placed in commercial storage, the Palace announced. A spokesperson said that disruption to royal events would be kept to a minimum. “The programme addresses the urgent need to overhaul the Palace’s essential services, some of which have not been updated since the 1950s. These important works will help avert the very real danger of a catastrophic building failure such as a flood or fire,” said Sir Michael Stevens, keeper of the privy purse (in charge of royal accounts). 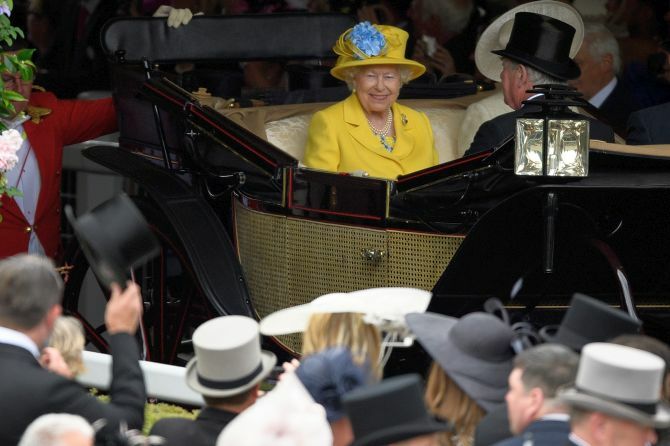 The Queen’s official expenditure is met from public funds in exchange for revenue from the Crown Estate -- or the extensive property owned by the monarch. The “core” Sovereign Grant, or expense allowance, is usually based on 15 per cent of the net surplus of the Crown Estate. However, from this year the total grant is based on 25 per cent of the surplus, an increase intended to meet the costs of refurbishing BuckinghamPalace. The palace said this sum represented an operational cost of 69 pence per person in the UK, up from 65 pence last year. The accounts released on Thursday also showed an increase in travel costs, from £4.5 million (Rs 40 crore) to £4.7 million (Rs 42 crore), with the most expensive trip being that of Prince Charles to India and the Far East in November 2017, which cost £362,149 (Rs 3.2 crore). It was during the India visit that the heir to the throne had passed on an invitation from his mother to Prime Minister Narendra Modi to attend the Commonwealth Heads of Government Meeting, which took place in the UK in April. Separately, figures from Clarence House -- Prince Charles’ private office -- showed an increase in funding of 40 per cent for the younger royals, including Prince William and wife Kate and Prince Harry and his wife Meghan Markle. The funding related to them shot up from £3.5 million (Rs 31 crore) to £5 million (Rs 44 crore). While no breakdown was provided, it is believed the rise was partly due to Charles paying for the wedding of Harry and Meghan, the Duke and Duchess of Sussex, at Windsor Castle in May. Trump, Trudeau, Merkel... How much do world leaders earn? For 60 years, the Queen has been carrying the same handbag!